It’s been a long time coming, but I can finally unveil the product I’ve been working on for months: the Pianocade, my first foray into the world of commercial Making! Inspired by my experience working on the Nuit Blanche Chiptunes concert last fall, the Pianocade is a programmable synthesizer and MIDI controller made to look, feel, and sound like vintage arcade games. I would’ve loved to have run a Kickstarter campaign to sell the Pianocade, but unfortunately Kickstarter restricts it’s projects to those based in the United States. There are international alternatives, but I decided instead to do it the old-fashioned way, so I’m taking preorders myself. Order one now, and tell all your friends! 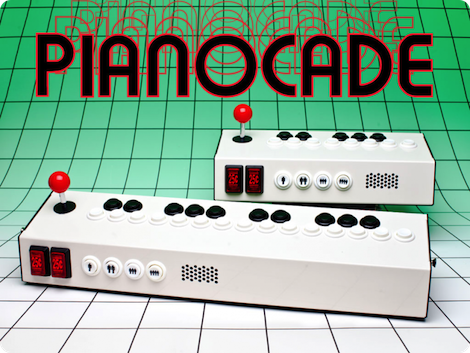 The Pianocade is 100% open source hardware, firmware, and software. All the code, schematics, and PCB files will be released when the product ships (if not before). In the meantime, I’m happy to answer any questions either here or via email at info@pianocade.com.